ROSEVILLE, Calif., Nov. 01, 2018 (GLOBE NEWSWIRE) -- via OTC PR WIRE -- InnerScope Hearing Technologies Inc. (INND) has entered into a Joint Development Agreement (the "JD Agreement") and an Exclusive Distribution Agreement (the "ED Agreement") with Erchonia Corporation ("Erchonia"), a world leader in the manufacturing and development of Low-Level Laser Therapy Technology ("3LT") and medical laser equipment using 3LT technology. As part of the JD Agreement, InnerScope and Erchonia will conduct FDA Clinical Research and Trials for the purpose of obtaining 510k FDA-Clearances for devices, technologies, methods and techniques ("Hearing Products") used in the treatment of hearing related conditions and disorders, including Tinnitus, Sensorineural Hearing Loss, Central Auditory Processing Disorders, Dizziness, Vertigo, Balance Disorders, and Meniere's Disease ("Hearing Disorders"). Both the JD and ED Agreements gives InnerScope the exclusive worldwide rights for all designs and any newly developed Erchonia 3LT lasers, related technologies and methods to be used to treat Hearing Disorders. Additionally, the ED Agreement will give InnerScope the exclusive rights and license to commercially distribute such hearing products worldwide. InnerScope and Erchonia have received approval under FDA regulations from a Institutional Review Board ("IRB") for the initial clinical trial of the effect of Erchonia's low-level laser therapy technology on the relief of tinnitus symptoms. The approved initial clinical trial site will be InnerScope's Value Audiology and Hearing Aid Center in Walnut Creek, California. The IRB also approved InnerScope's Director of Audiology, Dr. Kathy L. Amos, Au.D. Doctor of Audiology, as the Principal Investigator for the trial. Tinnitus is the perception of sound when no actual external noise is present. While it is commonly referred to as "ringing in the ears," tinnitus can manifest many different perceptions of sound, including buzzing, hissing, whistling, swooshing, and clicking. Approximately 15% to 20% of the world's population suffers from tinnitus. Tinnitus can be a severely debilitating problem, and numerous risk factors have been associated with the development of tinnitus. Those with a hearing impairment have a higher risk for tinnitus, and the associated increase in risk is dependent on the severity of hearing impairment. Furthermore, there is an elevated risk of tinnitus in people with a history of head injury, depressive symptoms, target shooting, arthritis, use of NSAID medications, hypertension, and smoking. In addition, individuals with intolerable tinnitus often suffer from higher rates of anxiety, depression, low self-esteem, and poor quality of life compared to those without tinnitus. According to the American Tinnitus Association ("ATA") estimates nearly 50 million Americans experience some form of tinnitus and roughly 20 million people struggle with burdensome chronic tinnitus, while 2 million have extreme and debilitating cases. Underlying hearing loss occurs in 90% of all tinnitus sufferers. Tinnitus is the number One Disability for Veterans. Tinnitus is the most common service related disability among veterans, with over 1.5 million American veterans receiving disability payments for intolerable tinnitus. 60% of veterans returning from Iraq & Afghanistan come home with hearing loss and tinnitus based on information from www.hearinghealthfoundaton.org. With tinnitus claims increasing at an annual rate of 15%, the total cost per year to the U.S. Department of Veterans Affairs for tinnitus related compensation to veterans is expected to have exceeded 3 billion dollars in 2017. Currently, other than tinnitus maskers or tinnitus management devices that only ease the perceived burden of tinnitus, there is no scientifically validated cure or any FDA-Cleared treatments for temporary relief for most types of tinnitus. InnerScope and Erchonia Hearing Products, when cleared, will be the first FDA-Cleared treatment for relief of tinnitus. InnerScope and Erchonia expect to be the first to receive a 510k FDA-Clearance for their Hearing Products that are not considered tinnitus "maskers" and/or tinnitus management devices, but offers a treatment protocol for relief of tinnitus symptoms. Both companies anticipate receiving the FDA-Clearance by the end of the third quarter of 2019. 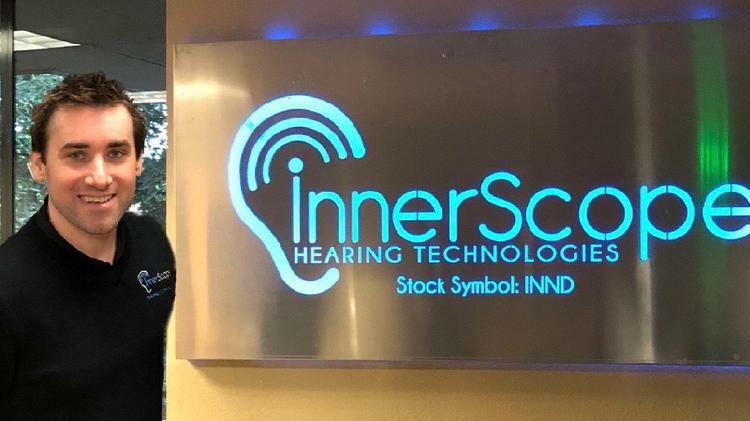 InnerScope plans to introduce (depending upon when the 510k FDA-Clearance happens) and commercially market and distribute the tinnitus hearing products to the audiological global market as early as December 2019. In addition, InnerScope plans on working with U.S. Department of Veterans Affairs for using its hearing products for treating the millions of U.S. veterans that suffer from tinnitus. "Erchonia is the world leader furthering research and development of its Low-Level Laser Technology for multiple medical laser applications," said Steve Shanks, President of Erchonia Corporation. "I would like to thank Mark Moore, InnerScope's Chairman, for contacting us a few years back introducing Erchonia to new medical applications using Erchonia's 3LT Technology for treating hearing disorders. Erchonia has had the pleasure working with Mark and Matthew Moore in developing treatment protocols using Erchonia's 3LT Technology for treating multiple hearing disorders. We look forward to many Erchonia and InnerScope FDA-Cleared devices for treating hearing disorders in the near future. "Our long-term partnership with the Erchonia, the world leader in 3LT research and technology, has resulted in the first of many opportunities to serve the hearing impaired," said Matthew Moore, CEO of InnerScope Hearing Technologies. "We are confident in a successful clinical outcome using Erchonia's 3LT technology to treat Hearing Disorders. Our Chairman, Mark Moore, has invested critical resources in assisting Erchonia in the development of these Hearing Products, and has witnessed the possibilities with resolute optimism. Once our tinnitus treatment receives the 510k FDA Market Clearance, we plan to market and distribute this worldwide to help the hundreds of millions of people who suffer from tinnitus. InnerScope and Erchonia also intends to obtain more 510k FDA-Clearances by developing more treatment applications for other Hearing Disorders using Erchonia's 3LT technology," Mr. Moore concluded.